Today, dozens of people joined in support of workers at the construction site at the former Iberville public housing development. Two workers from the site spoke of unsafe conditions and low pay at the site. 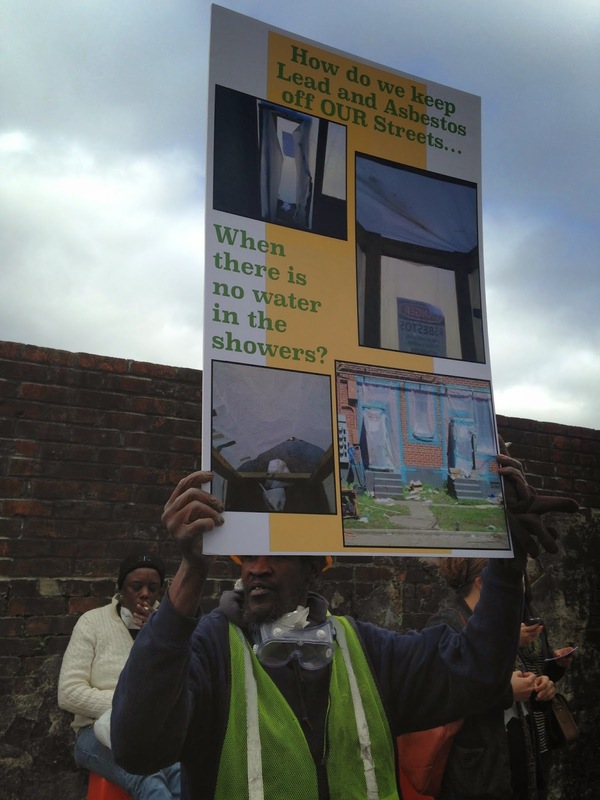 Durr Construction has not cared enough about New Orleans to ensure that Choice Neighborhood Initiative workers have the proper equipment to decontaminate themselves from lead, asbestos, and mold before getting on public transit and returning to their families. Workers are not even paid a living wage. Two brave Choice Neighborhood Initiative workers stood up to report serious heath and safety hazards to the community and to the City of New Orleans. Upon delivering the details of their complaint to the community a delegation of community members marched to Aimee Quirk’s office to deliver a detailed complaint to Aimee Quirk, the Director of the Office of Economic Development for the City of New Orleans. She accepted the letter in person but still has not responded to the explicit request to schedule a meeting with the worker complainants, Stand with Dignity, and Durr Heavy Construction to resolve health and safety violations and full and fair employment standards. Patrick and Junior are standing up to demand a better deal for New Orleans- they are putting their family’s livelihood on the line to make sure that New Orleans has better opportunities. They need your help to win a better deal for New Orleans, and a better deal for our community’s safety. "I am a walking hazard - they don't even have a decontamination area to remove the asbestos, lead, and mold I encounter every day. My health and the health of my family is worth far more than $12.75 per hour." - Patrick Delaney, Choice Neighborhood asbestos abatement worker. "It took me over a year to get this job but the only protection that they provide me is a paper dust mask - even though I encounter mold, lead and asbestos on a daily basis. And for all of these risks I am only paid $10 per hour - and so far only work 32 hours per week - $1,000 per month barely keeps the lights on." - Reginald Junior, Choice Neighborhood demolition worker.